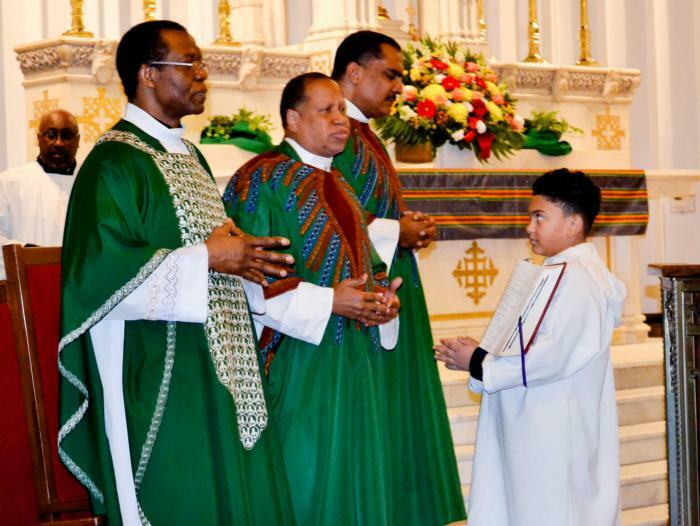 Mass celebrates Black History Month. Published 2/9/2018. Local. "Take a knee! Take a knee to witness the blessings of The Lord!" That was the message of Father Anthony Bozeman's homily at this year's annual Mass and celebration of Black History Month, Feb. 4, at St. Katharine Drexel Parish in Dorchester. Father Bozeman, SSJ, pastor of St. Raymond and St. Leo Parish in New Orleans, had hundreds of celebrants on their feet with his message that Black history is the history of us all. The Mass was the highlight of a "Day of Prayer for Families of African Descent." And, Father Bozeman pointed out that Scripture and science agree that human civilization began on the African continent. "Science calls her 'Lucy.' The Bible calls her Eve. But she is the ancestor of us all. We are, all of us, African-American," said Father Bozeman. The Mass was offered on Super Bowl Sunday. Father Oscar Pratt, administrator of St. Katharine Drexel Parish, introduced Father Bozeman as "a truly good person" despite the fact that Father Bozeman was born and raised in Philadelphia, home of the NFL's Eagles. More than 300 celebrants crowded the church for the celebration which featured inspirational music from the Archdiocese of Boston Black Catholic Choir, the Nigerian Community Choir and the St. Edith Stein Cape Verdean Youth Choir. After Mass, everyone moved to the parish hall for breakfast and fellowship.